More and more we're seeing cool mash-ups of things that go together in an ironic kind of way. 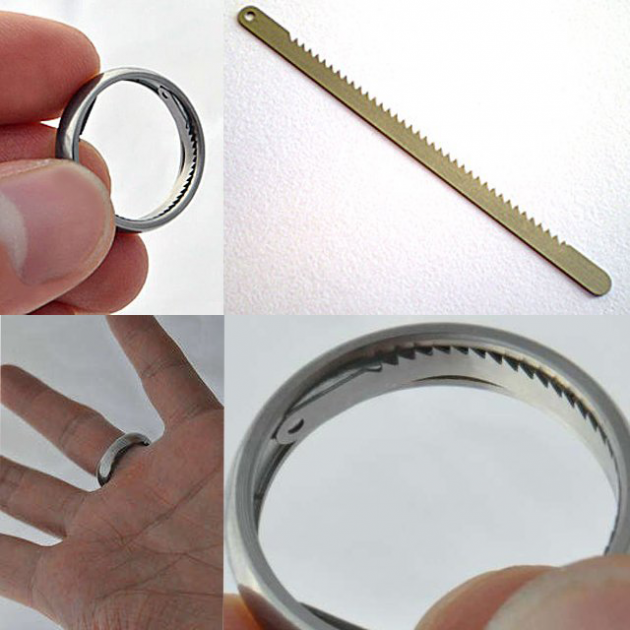 The titanium escape ring is a terrific example of the trend, adding a secret way out of matrimonial prison. It's made of titanium, cut from solid barstock and polished to a mirror finish. But unlike all other rings, this one contains a saw and handcuff shim pick combination tool which is completely hidden from view when worn. Located on a finger, its always in the exact area needed to quickly access and deploy, even when handcuffed. The shim can be used to open single-locked handcuffs, while the saw can cut zip-ties, disposable handcuffs, duct tape, rope, and other non-metallic materials.